My significant other now has an internship at a retailer. As an intern, he gets the perk of a slight discount for his purchases. He's also been excited to explore a store, now that he knows more about the inner workings of this company. So, we trudged off to a store to look around, and complete some needed shopping. Money has been tight lately, so we haven't bought a lot of "stuff" for ourselves lately. However, this trip was different. We could use the rationale that the discount would make the purchase more economical. So, we starting looking around at stuff that we had been drooling over for the past few months/years. Then, I remembered a very excited blogger describe one of his favorite appliances...and it so happens that the store carries this appliance. We looked at it...and we talked about it...and we looked at it some more. Then, we decided that we should buy it. So we did. Today, my significant other got a chance to play with it (he plays with all appliances and then gives me a thorough demonstration on how it works). 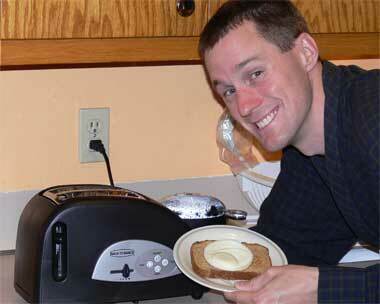 I am now proud to say that we are the owner of the BEST MULTI-PURPOSE appliance ever created. It slices! It dices! It even fries an egg! On my next post, I'll describe adventures with my new body groomer! It's true. I need to do a little work on myself. Now, there are folks who scoff when I say that I'm unhappy with my body appearance. I think they scoff mainly because I am a rather thin person. I am not struggling with obesity. However, my sedentary lifestyle has caused back problems for me, it drains me of my energy, and I have atrophied muscles. Yes, it's time to do something about it. I work at a college, and our college has a "work-out" space (for lack of a better term). I've always thought that this would be a good (free) alternative to spending big bucks to drive somewhere just to pay money to do basic exercise. So, I packed up some clothes and brought them to work with me. And last Friday, I finally worked up enough courage to enter the weight room. One main deterrent is the fact that I have no idea what to do in a weight room, and I don't like to look stupid in front of other people. Thus, working out in a weight room filled with athletes can be a little intimidating...or a LOT intimidating. So I went early in the morning. I know that those jocks don't get up before noon if they don't have to! So now I'm in the weight room by myself. There is a nagging thought in the back of my head that a person should not work out alone. I could drop a free weight on my head and smash it in. I could pass out from all the heart palpitations and not be discovered for hours. I shouldn't be alone. OR...I shouldn't do anything dangerous while I'm alone. That was the conclusion I came to. In order to not hurt yourself, you need to know what you are doing. I decided there were only about two machines that I could safely operate without fear of great harm. An elliptical-type walking thing, and a weight machine that would not require spotting. So, I alternated between the two. I set the weight on a rather low setting (I think it was 70 lbs), just so I didn't strain myself. I was in there for about 40 minutes, when I decided I should get back to work. Here's the other problem with working out alone for the first time. No one tells you that there is a lock on the locker room doors. I can't take a shower without a code! Dang! Now I'm going to smell like nasty, sweaty man all day long. I'm not sure if my little workout outing had any effect, until the next day when I couldn't raise my arms above my head. Luckily, I don't often have to raise my arms above my head, but I sure felt the pain. Apparently, this weight worked on one VERY SPECIFIC muscle...a muscle I was unaware I had until it screamed in agony the next day. Have I gone back yet? No. Do I plan to? Yes. I'm hoping that eventually, I'll be able to work out in front of other people, use a variety of machines, and become a more fit person. I'm back from my weekend in New York. It was a great trip. The weather was strange. At first it was oppressingly hot, then it rained for two days. That's OK. I loved it anyway. I did an initial scouting of Union Theological Seminary. It was a good visit. I need to do some more official steps, but I liked what I saw. This visit also reinforced my obsession with living in NYC. This isn't going to happen anytime soon, but it still remains a dream. The filming was sort of a let down. The ticket sales were very strong. However, the night of the showing was heavy rain. It flooded the subway, and prevented a lot of people from getting to the theatre. I made a few good contacts, but it could have been much better! Bummer. I also visited a church that is starting a homeless shelter for GLBTQ youth. They are only sleeping six a night. This is barely a tiny dent in the problem of GLBTQ youth homelessness, but it's a start. I hope their ministry continues. Yup, I really liked NYC. I still obsess over it. Maybe I'll live there, and maybe I'll just get to visit. I have to be OK with either. I hope you have great travels!